Patio umbrella bases come are available in a variety of weights and material - from granite to plastic. They serve an important purpose of keeping your umbrella from being lifted up out of the hole or from tipping over from the wind. It's not easy to find the heavier bases at your local home improvement stores. The most common umbrella sizes range from 6' to 12'. Free standing umbrellas require a heavier stand than one that is resting inside a patio umbrella table. A table offers more stability from gusts of wind or windy days. 3. The diameter of the umbrella pole. The most common umbrella pole size is 1.5” in diameter, but can range anywhere from 1 1/8" to 3”. 100+ lbs will support any free standing umbrella. Heavier stands are recommended when using an umbrella without a table, in very windy areas, or with a tilt option. There are several kinds of material to choose from such as granite, resin, and cast iron. 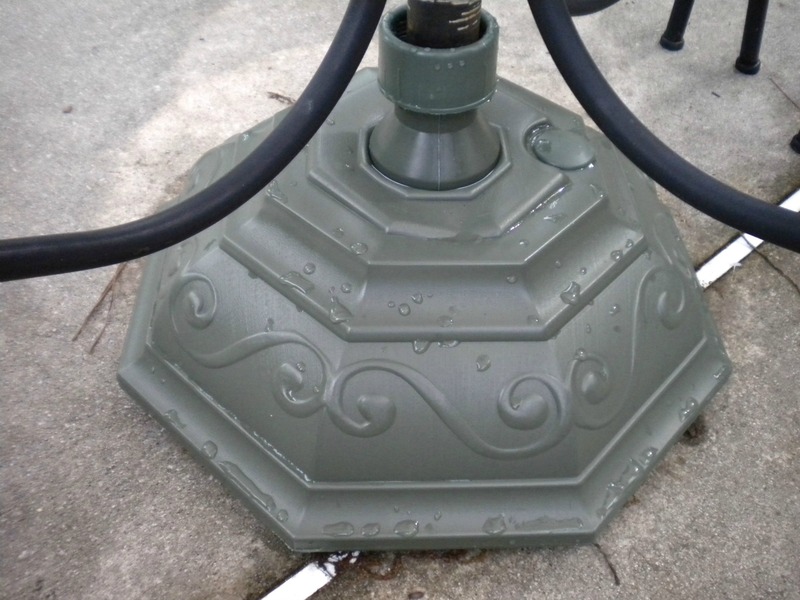 I bought this patio umbrella base from Amazon after reading that it was made of rust free material but had the look of a cast iron umbrella stand. My cast iron base had rusted after 2 short years. I liked the look but wanted something more long lasting. This one weighs 47 lbs - but the shipping is available for free at Amazon - amazing. A rolling umbrella stand is great if you like to move your sun protection umbrella to different areas around the pool. Patio umbrella bases must be very heavy to keep your umbrella from tipping over, but their weight can make it impossible to move, unless.... you have an umbrella base with wheels. An umbrella base with wheels is more expensive than those without - but it will save you money if you only want one patio umbrella that you can move to other locations around your pool. This rolling umbrella base provides the weight and stability that is needed for a free standing umbrella. Accessorize and add a table so that when you move your patio umbrella you will always have a handy table to place your drinks, cell phone and favorite book. The 21-inch diameter table accessory is set at the ideal seating height, 20-inches from the ground and comes in two colors - bronze and sand. The table only works with the Shademobile post. It's easy to install. It literally just screws in place. My most recent purchase for an outdoor umbrella stand was a resin umbrella base. While it needs to be filled with sand to add weight, I like the fact that it won't rust, chip or peel like the cast iron umbrella stand I purchased less than 2 years ago. These stands can be bought in a variety of colors to match the pole or frame. 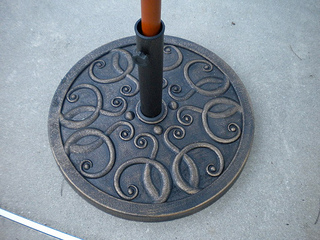 What we like about this attractive patio umbrella base is that it doesn't flake or rust like some other metal ones do. It also doesn't leave any rust spots or stains on the cement. Although it is the least expensive umbrella base it is one of the most durable. Made of heavy plastic it needs to be filled with sand or water to give it weight. This means more time and effort on your part especially if you use sand. You will need to go buy the sand and then pour all of the sand into a little hole. We simply put water in ours. Remember you need to empty it in the fall so that the water doesn't freeze and destroy the plastic. Forty to fifty five pounds of weight are needed to stabilize a 7.5 to 9 foot umbrella in a patio table. In case you haven't figured it out, the heavier the stand, the more it costs. This almost 75 lb stand is made out of poly resin which means it is 100% rust proof - unlike our powder coated cast iron umbrella stand. It is also means you won't get any rust spots on your cement. It is sold by Galtech and sometimes they offer free shipping specials. Perhaps you have a patio umbrella stand that doesn't weigh enough and find that your patio umbrella is still tipping over or if you live in a very windy area. You can add additional weight to your existing or new patio umbrella stand with these weighted bags. Add one to two bags of sand and pour it into the weighted bag. Get a funnel as the opening is very small. The new design is made of heavy duty canvas with extra secure stitching and new with an improved extra large opening for adding the sand. It comes in two different shapes - either the round as pictured or square. 18" Round Umbrella Base Weight Bag - Up to 85 Lbs. for Patio, Offset and Cantilever Umbrellas. A cantilever umbrella requires more weight than one that is set into a patio umbrella table. The usual requirement is at least 100 pounds. These are also called off-set patio umbrellas and are often used in seating areas to provide some needed shade. This molded plastic cantilever umbrella stand is made by Southern Patio. It can be used on off-set umbrellas that have a "t" or "cross" base. Fill it with sand or water and it provides 150 lbs of stability. 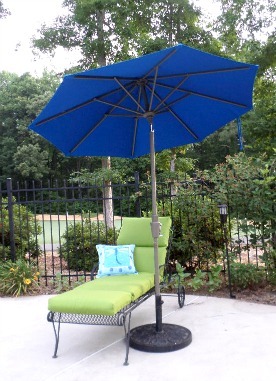 A cast iron umbrella base provides a decorative and sturdy base for any patio umbrella. They are heavy, provide lots of weight and are long lasting. Many people like the look of a cast iron umbrella stand - including me. But I don't like how quickly they rust and peel. It is an attractive way to hold your patio umbrella. If you still decide you want cast iron, look for a durable, rust-resistant powder-coat finish - but even that won't guarantee it won't rust and you can end up with a rusted umbrella stand and rust stains on your pool deck. Amazon carries a variety of cast iron umbrella stands that are often less expensive than buying them at a store. Or as in my case, I bought an outdoor umbrella on line and expected to buy an umbrella base at a local store. Would you believe that by the end of July all of the stores like Home Depot, Lowes, and Target were all out of umbrella stands? Amazon provides a great selection - much better than any local home improvement store. Many of them offer free shipping which is amazing. This cast iron base weighs 40 lbs, and costs about $100 with free shipping. Do I Need a Patio Umbrella Base? You may think that because your patio umbrella pole seems stablized by going through a patio table that perhaps an outdoor umbrella stand is not needed. I can tell you that, it isn't true. Ask me how I know :). 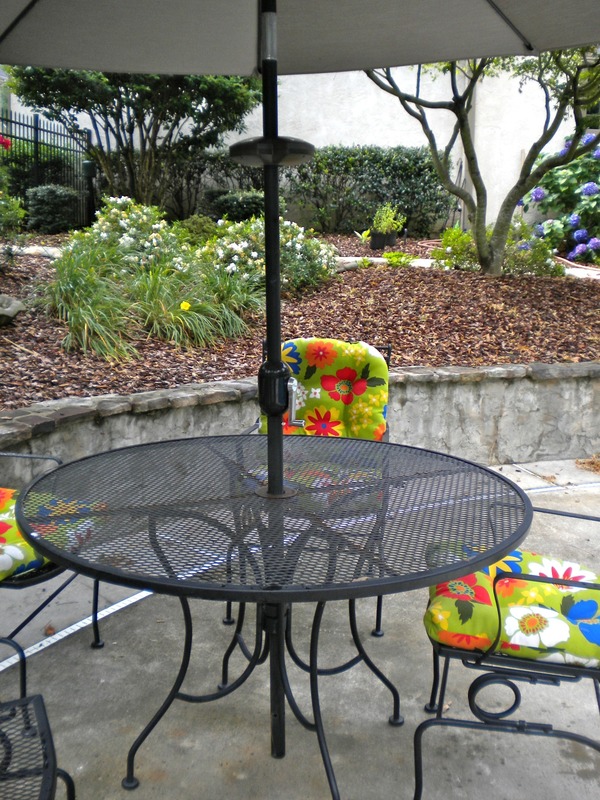 A weighted base or stand is necessary for any outdoor patio umbrella. Patio umbrella bases provide stability to your outdoor umbrellas. They prevent umbrellas from blowing or tipping over. First it's important to get the right weight and then to decide on the material or design that you prefer.